The coroner is at the scene of the fatal crash. 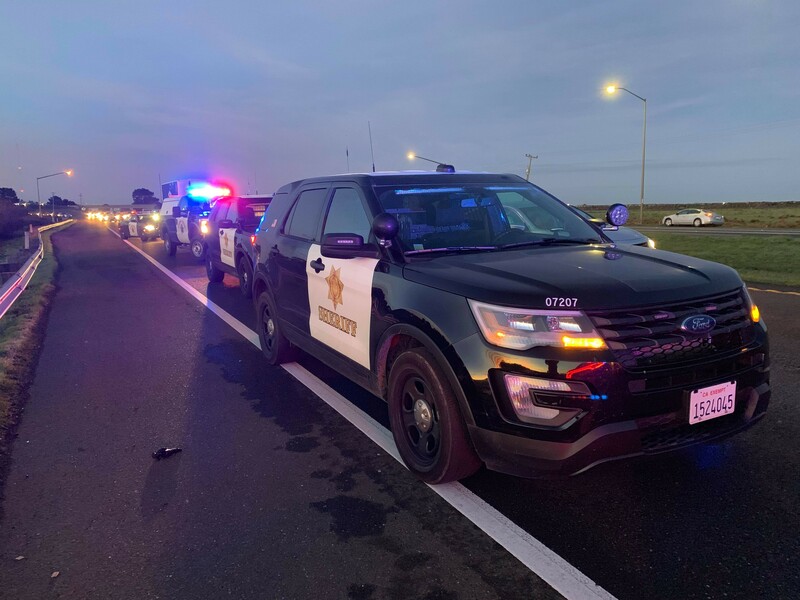 A man was killed this morning on U.S. Highway 101 after being hit by a car in one of the northbound lanes just north of Humboldt Hill around 6:30 a.m.
His name is not being released pending notification of next of kin, a CHP release states. According to the release, a 31-year-old Eureka man was traveling northbound when he looked over his shoulder to check for traffic before changing lanes then looked forward to see a man in the lane in front of him, whom he struck. Read the full release from the CHP here. FOURTH UPDATE: Caltrans is reporting at 10 a.m. that both lanes are now open. Readers report that traffic is moving normally through the area now. 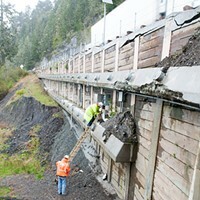 Caltrans reports U.S. Highway 101 northbound has one lane open. Traffic remains snarled on northbound U.S. Highway 101 closing in on 9:30 a.m. with cars still inching forward in the aftermath of a fatal pedestrian accident. Law enforcement is controlling traffic to allow feeder roads access to U.S. Highway 101. They are alternating traffic, allowing a number of vehicles to travel north then they stopping to let vehicles from Humboldt Hill Road go and repeating the process. Commuters attempting to enter U.S. Highway 101 after a fatal crash closed the roadway are being stopped on the feeder roads, including what seems like “hundreds” of vehicles at Humboldt Hill Road and South Broadway, including a school bus, according to a Redheaded Blackbelt reader. 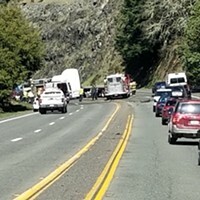 Northbound U.S. Highway 101 came to a standstill this morning south of Eureka after a person was hit on the roadway. 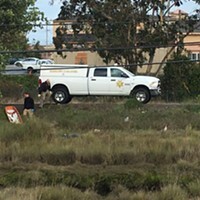 Lt. Bryan Quenell of the Humboldt County Sheriff’s Office told Redheaded Blackbelt photographer Mark McKenna that the Coroner’s Office was on scene just after 7:30 a.m. They hope to remove the body soon and get the road open. The CHP CAD page indicates that at least six additional vehicles have hit the pedestrian including a big rig.